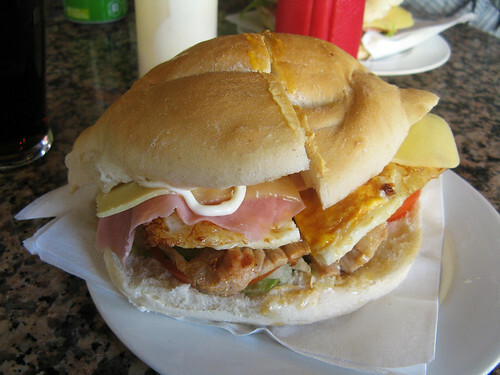 FILLING: This Portugese beast is packing fried pork, a fried egg, a slice of processed ham, a slice of Emmenthal style cheese, lettuce and tomato. PROS: Well, no-one could accuse them of being stingy with the filling. That’s a lorra lorra protein for £4.50. The bap was nice; fresh with a good bit of chew. CONS: Let’s start with the pork, shall we? It was fine; clearly cheap meat but you know, fine. I think it had been marinated but didn’t have much flavour save for one bite when I found myself dealing with a piece of garlic. It was chewy, too. The egg was okay; they cooked it on both sides, I assume to make it easier to eat. It’s annoying to be presented with a fried egg and yet denied the joy of the oozy yolk though, don’t ya think? The processed protein products on top were um, unexpected. I don’t shy away from a slice of mystery meat and I regularly plunge headlong into the guilty pleasure pool of processed cheese but jeez, what was the point here? The lettuce and tomato underneath was…well it was there. Yes, definitely there. The sandwiches (I subjected a friend to this delightful lunchtime experience also) arrived at the table with mayo and ketchup. I squirted a bit of mayo on mine, mainly because I wanted to do a pattern with the squeezy bottle. Also, I don’t know what that substance is on top of the bun that was clearly left behind by the knife used to cut it, but I’m pretty sure it wasn’t in my sandwich. We were hungry, me and my mate, so we managed about half of our sandwiches. As I looked up at him to declare defeat I noticed he looked pale and concerned, “my pork” he said through a mouthful of four kinds of protein, “it’s raw in the middle”.